This summer, I insisted upon a mandatory daily routine of getting outside. At first, Kyra and Ethan couldn’t wait to race their Cozy Coupe, bikes, and scooters in our yard. I proudly noted gear-tester talents manifesting on days that it rained. 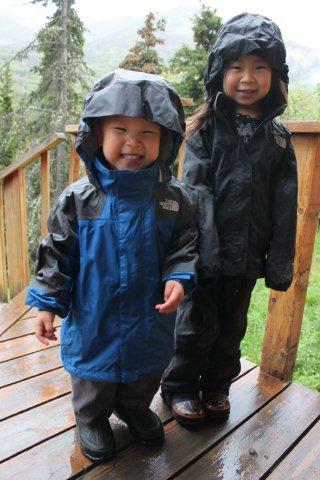 A big smile broke across their faces when they remained dry while the world around them soaked. 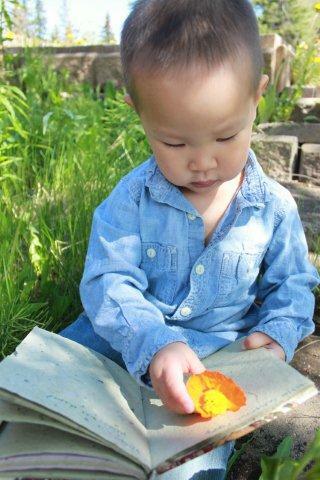 Kyra usually collected sticks, gifted me dandelions, and took Ethan on adventures. Ethan enjoyed sitting on my lap on the deck and playing our “What’s that Sound” game. Closing his eyes, he can now name every sound he hears accurately, including discerning the difference between a squirrel and a bird. Recalling the plan I outlined in Dandelion Killer to explore what’s outside our doorstep, one day, I tossed onto the living room floor a bunch of guidebooks on flowers and plants. Two seconds later, she was done. 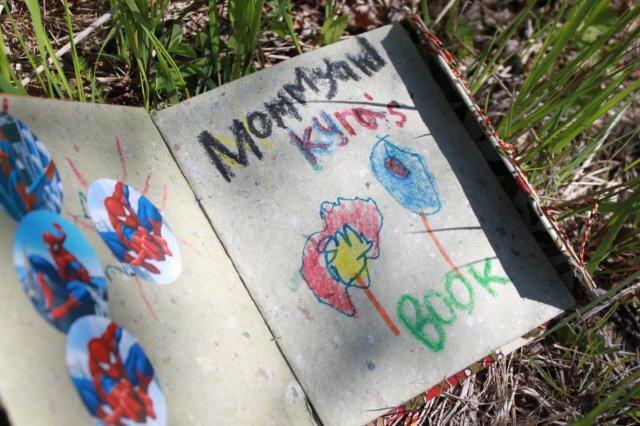 In crayon, she had scribbled the words, “Mommy and Kyra.” She slapped on some Spiderman stickers and then handed the journal to Ethan, who honestly was much more interested in tattooing himself with markers. Delicately negotiating her “now that I’m done with Kindergarten, I’m in charge” attitude, I explained that once we put the flowers in the book, we couldn’t open it for at least 24 hours. Now, the title page was exciting enough to entice Ethan’s attention. 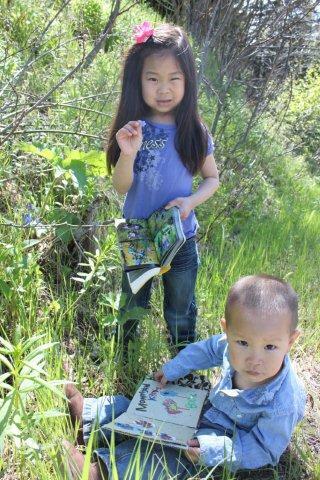 He insisted on carrying the journal and Kyra grabbed a guidebook. Outside, they ran up to the first flower they saw, my one and only California poppy that had bloomed overnight, and picked it. I made a note to myself that I had to read them Eric Carle’s The Tiny Seed at bedtime and show them how to be nice to plants. “Fine,” she huffed and puffed. 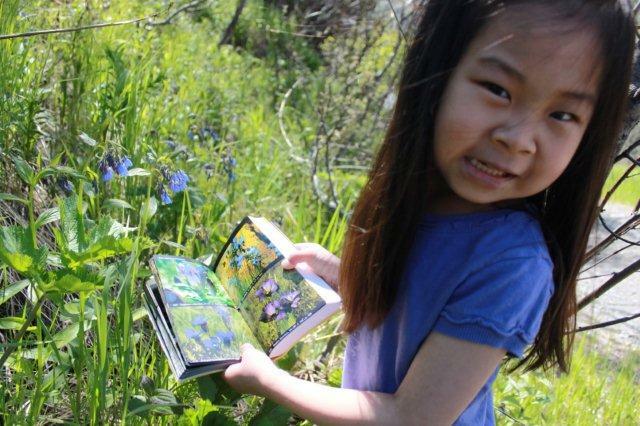 I did have to teach Kyra how to use the guidebook, but she was very proud to name the Bluebell. As the sun warmed my face, I recognized that this was one of those rare moments where I think I got my parenting right. Plant press, which I might try next. 75 Tricks to Get Your Kids Outdoors.